Sixty-nine years after Israel declared Jerusalem as its capital, and 23 years after the US Congress passed a law mandating that Washington move its embassy there, the US formally opened its embassy in the city on Monday afternoon, in a move Prime Minister Benjamin Netanyahu called "courageous" and "momentous." "What a glorious day. Remember this moment!" Netanyahu entreated the applauding crowd. "President Trump, by recognizing history, you have made history. All of us are deeply moved. All of us are deeply grateful." "Last December, President Trump became the first world leader to recognize Jerusalem as our capital, and today, the United States of America is opening its embassy right here in Jerusalem," Netanyahu said. "Thank you President Trump, for having the courage to keep your promises!" In a video address to the assembly, US President Donald Trump said the move was "a long time coming," and that Israel, like all sovereign nations, has a right to name its own capital. "The US will always be a great friend of Israel and a partner in the cause of freedom and peace," Trump said. "We extend a hand in friendship to Israel, the Palestinians and to all of their neighbors. May there be peace. May God bless this embassy. May God bless all who serve here and may God bless the United States of America." Trump's son-in-law and senior advisor, Jared Kushner, took the stage. to declare that "When President Trump makes a promise, he keeps it." "By moving our embassy to Jerusalem, we have shown the world once again that the US can be trusted. We stand with our friends and our allies, and above all we've shown that the US will do what's right, and so we have," Kushner said. "The US stands with Israel because we both believe in freedom. We stand together because we both believe in human rights. We stand together because we both believe that democracy is worth defending. And the US stands with Israel because we know that it's the right thing to do." Kushner received resounding applause when he mentioned President Trump's decision last week to exit the Iran nuclear agreement, and when he gave thanks to US Ambassador to the UN Nikki Haley for her hard work. Kusher also reiterated the US's commitment to helping find a peaceful end to the Israeli-Palestinian conflict. "Jerusalem must remain a city that brings people of all faiths together," he said. "As Israel turns 70, the search for lasting peace turns over a new leaf: one of realism, and of courage to stand with our allies for what is right and what is true." Kushner said one day, humanity would look back at this moment and note that "the journey to peace started with America recognizing the truth." "If we dream big, if we lead with courage, we can change the trajectory for millions from hopeless to boundless." In his address, Israeli President Reuven Rivlin thanked Republicans and Democrats alike for their love and support of Israel. He received a standing ovation when he said, "Every US president has promised to move the American embassy to Jerusalem. Finally we have a leader who promised this, and also kept his promise!" "The Israeli people thanks you for keeping your word, for your courage, for your determination and for your firm, unwavering stance alongside the State of Israel," he continued. "We hope and expect that other nations will follow your path and your leadership. We will continue to safeguard Jerusalem as a city of peace, as a home to all those of faith, a city of all its residents and citizens, of all religions and communities, who share together one city, which is so greatly loved by everyone." In the final address before the benediction, Netanyahu, addressing the US delegation, said, "We have no better friends in the world, you stand for Israel and you stand for Jerusalem. Thank you!" Reciting a chain of historic events that took place in Jerusalem, from David declaring it as capital to Israeli soldiers regaining the Temple Mount in 1967, Netanyahu said, "We are in Jerusalem, and we are here to stay!" Netanyahu also saluted the Israeli troops defending Israel at all hours. "We gather here today to celebrate another historic day in the life of this city, which I know will take its place alongside other momentous decisions in the history of our people," he said. "Thank you, President Trump, and thank you all, for making the alliance between America and Israel stronger than ever." "My friends, this is a great day for Israel. It's a great day for America. It's a great day for our fantastic partnership... but I believe it's also a great day for peace," Netanyahu remarked. "The truth and peace are interconnected. A peace that is based on lies will only crash on the rocks of Middle Eastern realities. And the truth will always be that Jerusalem has always been, will always be, the capital of the Jewish state." 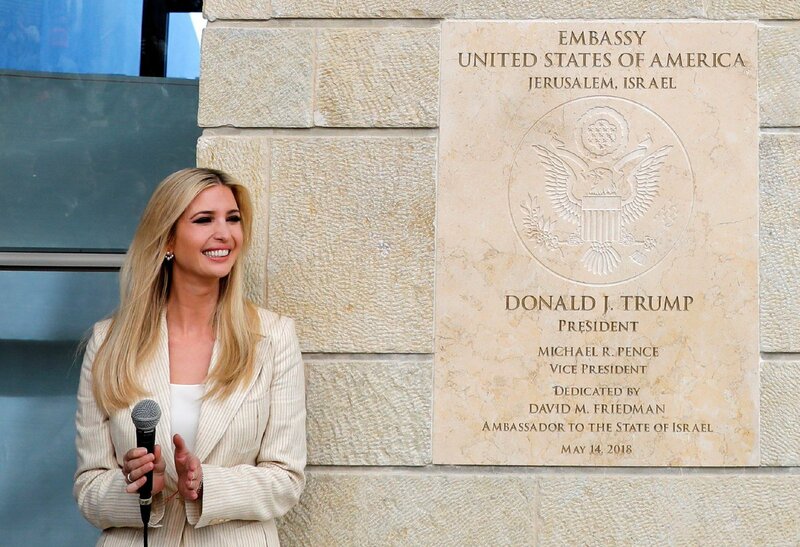 "May the opening of this embassy, in this city, spread this truth far and wide, and may the truth promote a lasting peace between Israel and all of our neighbors."